Last week, the Elementary Division of the North Jersey School of Music Association (NJSMA) held a workshop that featured music educator, author, and clinician, Denise Gagne. Many of us have used several of Denise’s materials from Musicplay to her recorder materials, to her apps, to so much more (http://shop.musicplaytext.ihoststores.com/default.aspx). She has a plethora of early childhood and elementary materials for the music classroom that are student-tested and work well for any classroom environment. Recently, Denise launched Musicplay Online (http://musicplayonline.com/), which is an amazing supplemental website for the Musicplay curriculum. She has placed audio files, manipulatives, pdf files of items for download, videos, music creation activities, interactive instruments, and more on this website. This website is subscription-based; however, if you attend her workshops, she gives you a three-month subscription for free. Finally, when I attend a Denise Gagne workshop, I love that she never presents the same workshop twice. She always switches it up and keeps it fresh. As a presenter, I greatly admire that as it is very tough to do! Denise began her workshop with warm-ups for the body and voice. She demonstrated her app, Vocal Warm-ups for Singers or Choir. 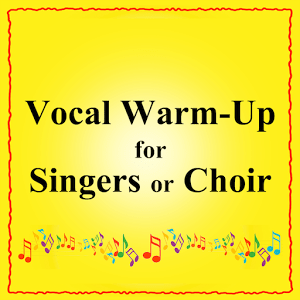 This is a great app for any singer or chorus from elementary to college. My favorite aspect of this app is that there is always one jazz warmup with each set of warm-ups listed in the app. She then talked about the Sub Tub that she is creating and will be available for sale next year. It will include games, manipulatives, etc, for those days you need to leave quick plans. 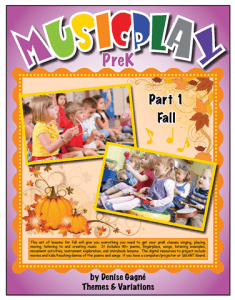 Denise introduced her new, student-tested, PreK Musicplay curriculum. She demonstrated some great activities such as “Three Little Monkeys” to emphasize high and low sounds, “Monkeys” to emphasize actions and can be advanced to include partners, “Let’s Play Instruments” to pass out instruments in a 7/8 meter, and so much more! She has many songs and activities that have the students experiencing steady beat, high and low sounds, loud and quiet sounds, and fast and slow sounds. Her book comes with the CD and the digital resources. I downloaded them all this evening and was thrilled to find videos of her with the PreK students for many of her activities. 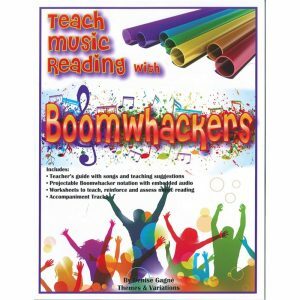 Denise showed us this music book, Teaching Music Reading with Boomwhackers, which I feel is very unique because there are not many boomwhacker resource books where the goal is to teach music reading. 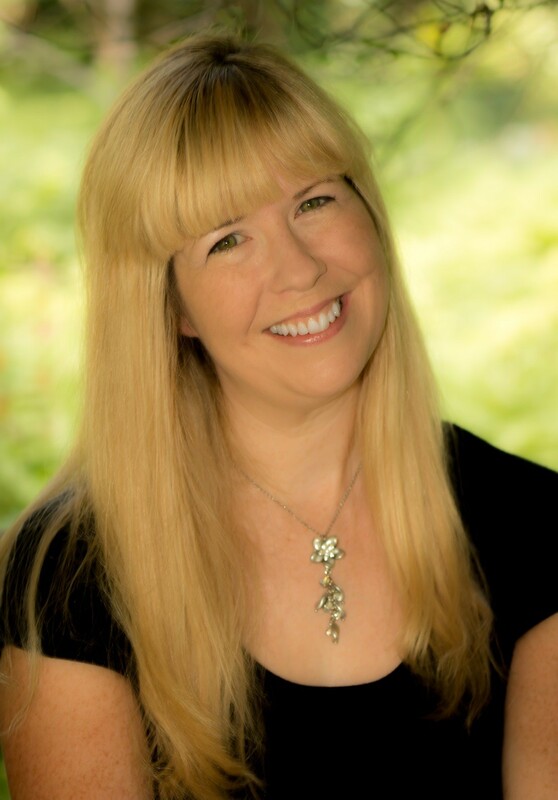 Denise uses a sequential process to take your students in grades 2-5 through learning 55 musical examples. Denise tested these activities with third graders and had great success with them. 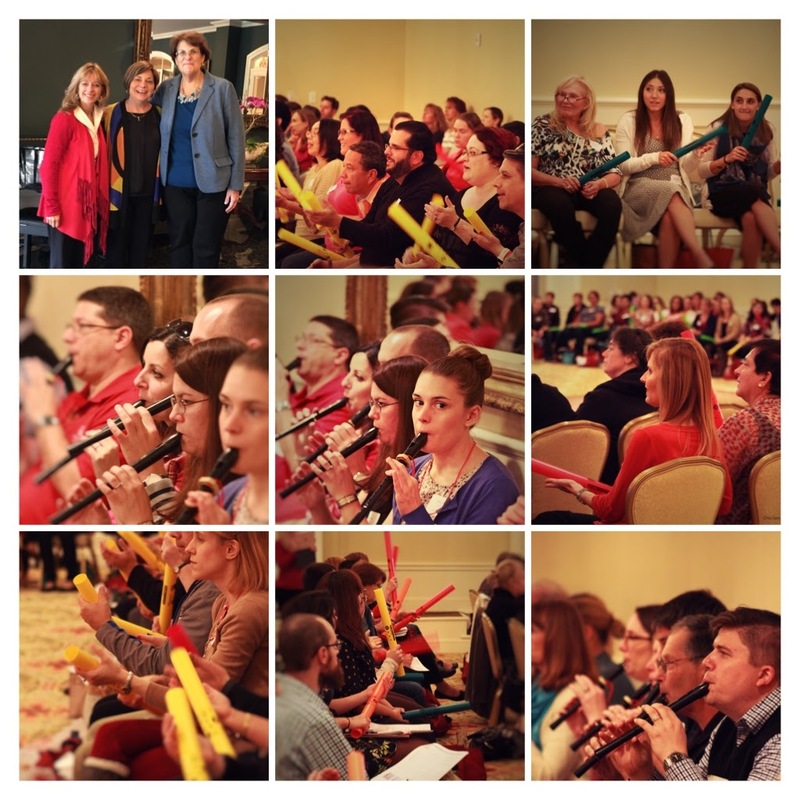 Here is a video from the workshop where the music educators are enjoying their boomwhacker rendition of Chop Sticks. Denise had us up and moving throughout the entire day. When we finished, we were exhausted in the best way possible. We had learned so many new dances and activities for our students as well as reviewed many favorite songs. This was a fantastic group of sixth grade general music students performing numerous selections that showed the students singing, performing, and moving to music. 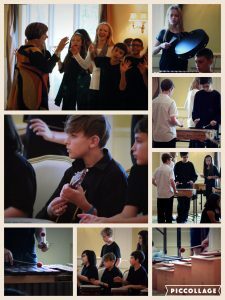 I loved the versatility of these students as they switched instruments during the song selections and took great care in listening to each other so that they performed with a beautiful balance as well as a good enthusiasm. 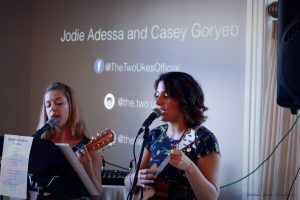 Throughout the day, we enjoyed performances by The Two Ukes, who are Jody Adessa and Casey Goryeb, two NJ music educators who on top of teaching, arrange and play music at local venues. 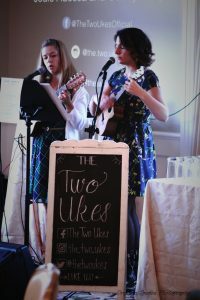 They are quite talented as their harmonies and singing voices blended together beautifully. In addition, they will change from ukes to banjos to give a different sound and feel. 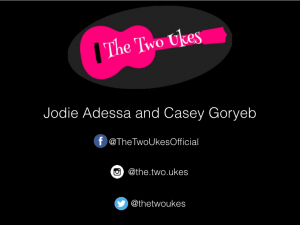 Their next gig is at Table 42 in Dover, NJ on Friday October 21, at 7 pm. Do You Want to See Highlights from This Day? I created a one-hour video of highlights from this day that I will send to Denise to approve. Once that occurs, I am going to offer the highlight video to anyone who attended the workshop. For those who are NJMEA/NAfME members, if you watch the highlight video and write-up a summary, you can receive 1 hour of PD. The entire day was inspirational! I personally thank Chair Lisa Ludwig Wichman, who made the day flow so smoothly. In addition, great thanks to Carol Richardi -Co-Chair/Registrar, Jodie Trappe Adessa, Karen Andruska, Laurie Arslanyan, Ken Barry, Emma Brondolo, JP Butcher, Kiera Casper Chiarino, Debbie Cicchino, Ardith Collins, Nicolette Corrado, Anna Maria Ferrone, Catherine Flynn, Rachel Fountain, Casey Goryeb, Kim Kanefke, Rebecca Jacobsen, Irene Tsotsoros Lahr, Deborah Norris Mello, Glennis Patterson, Tara Ann Postigo, Katy Ann Reiser, Mark Richardson, Donna Fiorito SanGiovanni, Jennifer Drechen Spence, Christine Reda-Sulling, Kelly Lydon Wisneski, and so many more who made this day happen. Finally, a huge thank you to Denise Gagne. She inspires me and shows me daily through her work that we need to keep teaching music to young children because it makes a great difference in their lives!